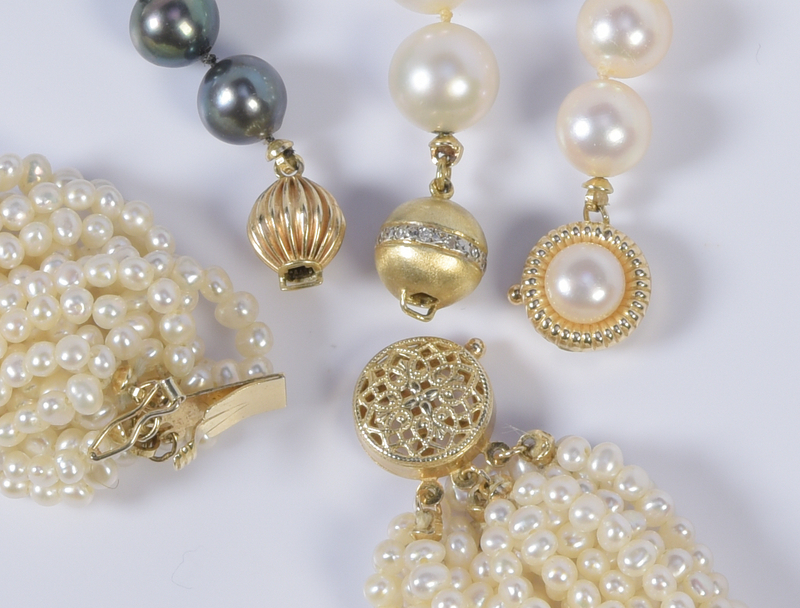 1st item: 9.10 mm x 9.97 mm white cultured pearl necklace with 14K satin finish round ball clasp with diamond highlights. 17 3/4" L total. 2nd item: 8.05 mm x 8.40 mm faint pink cultured pearl necklace with 14K round clasp with safety clasp, 17 7/8" L total. 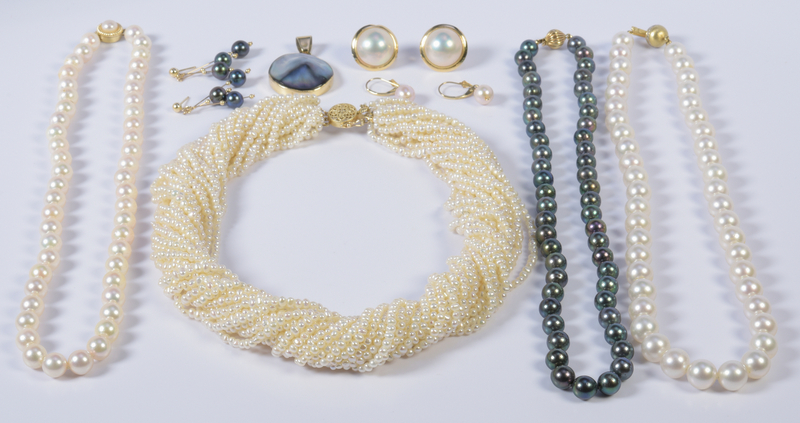 3rd item: 22-strand freshwater pearl necklace with 14K clasp, 17 3/4" L total. 4th item: 7.25 mm x 8 mm purplish-black freshwater pearl necklace with 14K ball clasp, 18 1/4" L overall. 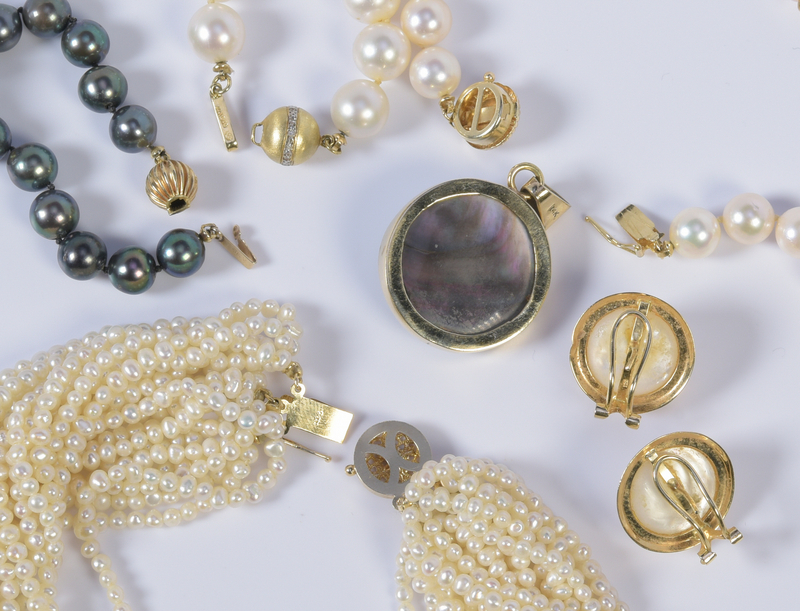 5th item: 14K pendant with freestyle blister mottled grey pearl set in bezel mounting, 1 1/2" H x 1" diameter, 8.5 grams. 6th-8th items: 3 pair 14K earrings for pierced ears. 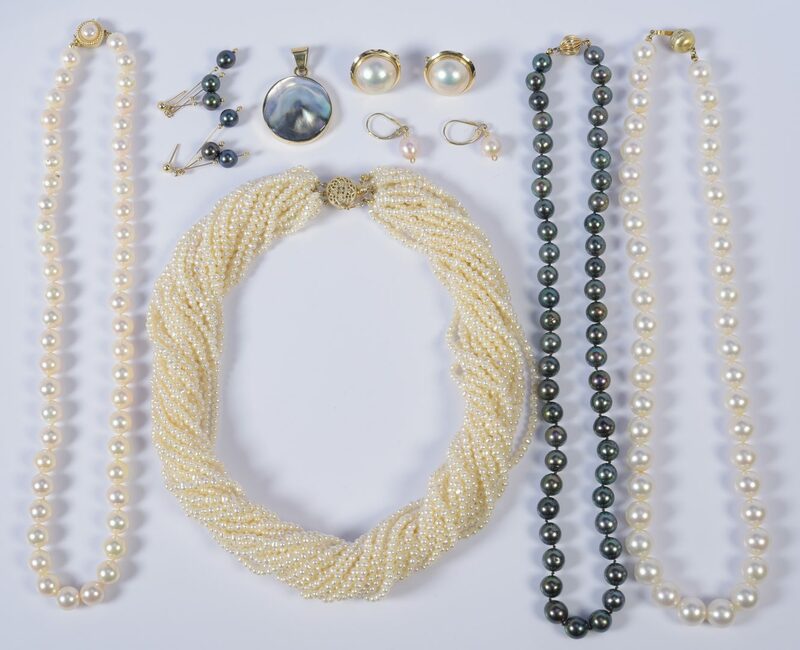 1 pair of mabe pearl button earrings with French clip and post backs; 1 pair 14K freshwater pearl drop earrings and 1 pair 14K purple-black freshwater pearl triple dangle earrings, 3/4" to 1 1/2" L. Provenance: Estate of Sarah Hunter Hicks Green, Nashville, Tennessee. CONDITION: 1st item: Good luster and symmetry. 2nd item: Very good luster and symmetry. 3rd item: Good condition with surface grime. 4th item: Good luster and symmetry; scattered blemishes. 5th item: Very good condition. 6th-8th items: Very good condition.